Warm, delicious, savory and nutritious, a gift of gourmet soup is always in good taste. 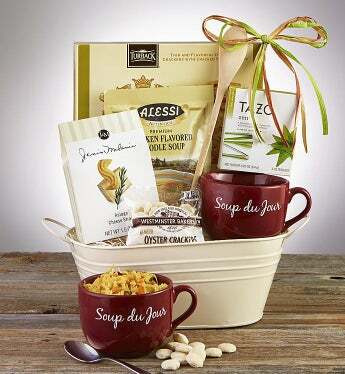 Treat them to this rustic basket filled with feel good flavorful favorites including Our Favorite Chicken Soup with Noodles from Alessi®, Tazo® Zen® Tea, and Janis & Melanie® Asiago Cheese Straws. Includes a jumbo stoneware "Soup Du Jour" mug and a solid Maple wood spoon.